An Asterope in GTA V.. 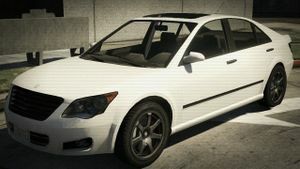 The Karin Asterope is a four-door sedan in Grand Theft Auto V.
The Asterope's design is based primarily on the 2007-2011 Toyota Camry with subtle influences from the 2010-2014 Chrysler 200 on the front facade. The Asterope is powered by a 3.5 litre V6 engine (according to badging on the boot), channelled to the rear wheels. Handling is fair, although driving may be marred by the soft suspension. This page was last modified on 27 March 2014, at 19:13.